I’ve been a fan of Futurama since it premiered oh so many years ago — I’m not going to look up the exact date because I’m afraid it’ll make me feel old. I was crushed when it was cancelled the first time, and I was overjoyed when it relaunched as a series of movies, buying each one on DVD. Unfortunately, I somewhat lost track of the show after that due to Comedy Central not being a thing in Canada, but recently, I’ve been getting caught up on the most recent seasons, and I’ve been reminded just how much I truly love it. It’s not just that it’s funny — although it is, extremely. What I really appreciate about Futurama is how much respect it has for its source material. Yes, it’s a send-up of science fiction, but you can also tell that the writers are true sci-fi fans who have a real love and respect for the genre. I think of the episode “Where No Fan Has Gone Before” — a must watch for any and all Trekkies — and while it (quite brilliantly) poked fun of all the foibles of Star Trek and its fandom, it also took the time to talk about the positive impact Trek had on Fry’s life. 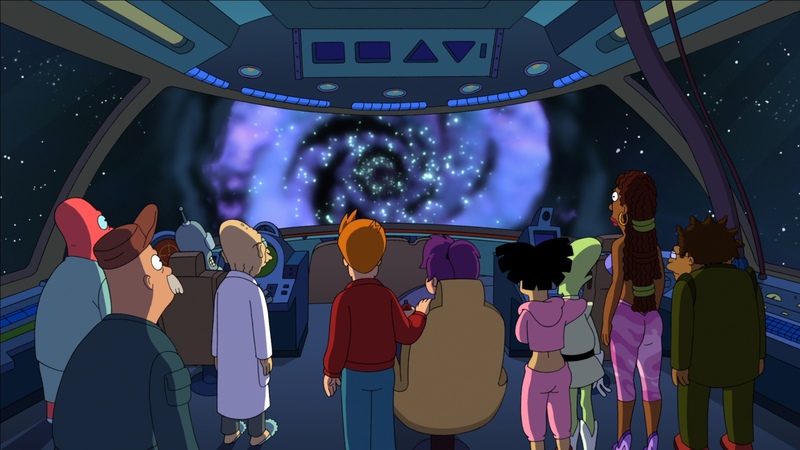 A lot of Futurama’s stories are very clever pieces of science fiction in their own right, in addition to being comedic. Into the Wild Green Yonder, for instance, could have easily worked as a serious sci-fi epic. The concept of the ebb and tide of green energy being responsible for all of history’s mass extinctions, and the fight to usher in a new Green Age and restore all of the vanished species, was just awesome. Of course, they presented it all in the most silly and ridiculous way possible, because it’s a comedy and that’s what they do, but with a different treatment, Into the Wild Green Yonder could have worked just just as well as a straight-faced adventure. Big ideas like that are what make sci-fi and fantasy so magical — no pun intended. Blizzard recently unveiled the updated model for Night Elf females, and I have to say, this is perhaps the first new player that strikes me as a significant improvement over the original — with the Orc female as the only possible exception. This is exactly how a Night Elf should look. Timeless and graceful, but with a feral and amazonian edge. I can’t wait to play my monk after the change. She’s going to look so badass. Heck, between the awesomeness of this model and my less than positive feelings toward the new human female, I’m almost tempted to race change my rogue, too. On a tangentially related note, I was also thoroughly impressed by the preview of the new Blood Elf Tyrande skin for Heroes of the Storm over at Heroes Nexus. Especially the blue-tint/High Elf one. This is a rare case where I’m willing to overlook a case of “female armor” because she just looks that badass. Although if it were up to me, she would be wearing pants. This entry was posted in Games, Misc. and tagged because Elves that's why, fantasy, Futurama, Heroes of the Storm, humour, sci-fi, Warcraft, World of Warcraft by Tyler F.M. Edwards. Bookmark the permalink. Is it just me or does the new NE model have even *bigger* man-hands than before? Other than that I think they look great – might have to drag out my old NE Hunter. I think it’s the way her hands are positioned in this image. Her fingers are less curled in the new model than the old one, hence they appear longer. I don’t mind the “man hands” myself. The better to smite her enemies with!